It must be a Duck Tracks quilt block. 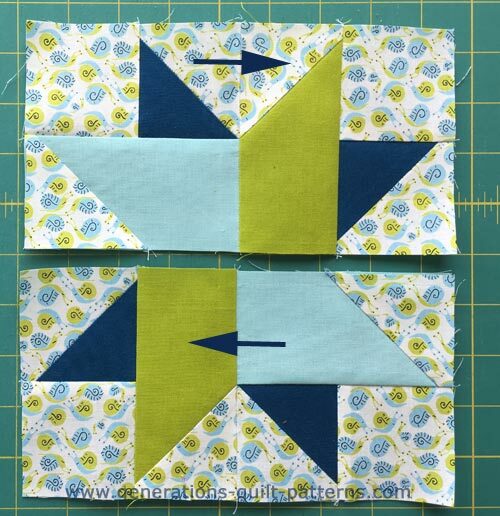 To create this little gem, we'll use connector corners and quick-pieced half square triangles. With these techniques you won't be quacking like a duck, you'll be soaring like an eagle. 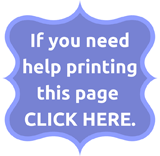 All seams are a 1/4" unless otherwise noted. Pressing instructions are included at each step. I do like to starch my fabric before cutting. It makes finger-pressing the seams of the connector corner units much easier. And finally, sometimes the connector corners can get a bit lumpy. Use this simple pressing technique to flatten them with ease. 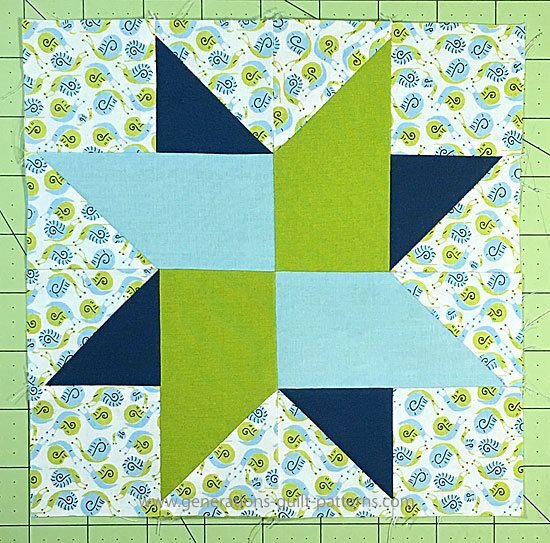 This design could be used to represent flowers—use a leafy green for the #4 patches and then all sorts of florals or floral/solid combinations for #2/#3. Remember. YOU. Are. The. Designer! In the cutting chart below, there's an asterisk next to Patches #4 and #5. Because I prefer to cut my HST patches a bit larger, stitch them and then trim to perfection, I add an extra 1/4" to the measurements listed in the chart, i.e. 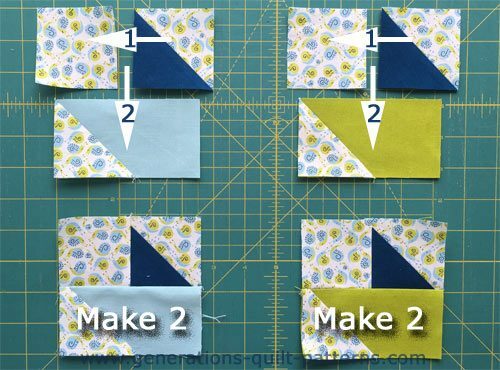 for the 8" sample in this tutorial, I cut those patches at 3-1/8" square or 2-7/8" + 1/4" = 3=1/8". 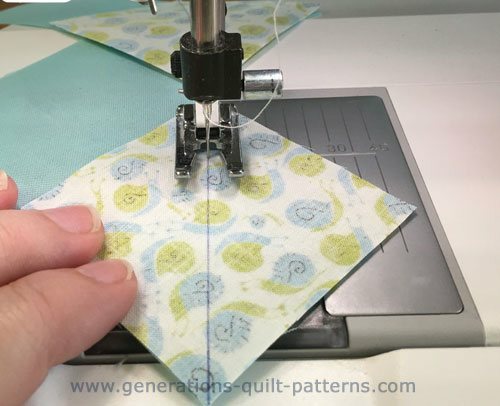 If you have the perfect quarter inch seam, cut those patches at the measurements listed. 1, 6	 Bac	 8	 1½" x 1½"	 2" x 2"	 2½" x 2½"	 3½" x 3½"
2 A	 2	 1½" x 2½"	 2" x 3½"	 2½" x 4½"	 3½" x 6½"
3 B 2	 1½" x 2½"	 2" x 3½"	 2½" x 4½"	 3½" x 6½"
4*	 C	 2	 1⅞" x 1⅞"	 2⅜" x 2⅜"	 2⅞" x 2⅞"	 3⅞" x 3⅞"
5*	 Bac	 2	 1⅞" x 1⅞"	 2⅜" x 2⅜"	 2⅞" x 2⅞"	 3⅞" x 3⅞"
Unfinished Block Size	 4½"	 6½"	 8½"	 12½"
Grid Size	 1"	 1½"	 2"	 3"
And these are the cut patches. I've already drawn the diagonal line (see arrow) on the back of the four #1 squares. It's a good idea to lay out the #1, #2 and #3 patches as shown below. 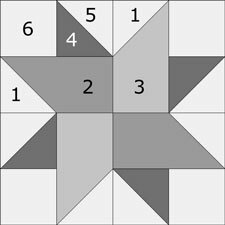 It's much too easy to turn the #1 squares the other way. (The drawn line should touch the upper right corner of the rectangular patches.) Ripping is not my idea of a good time. Draw the line only as dark as you need to see it. Sew on the drawn line. I prefer my open toe applique foot for this. It's easy to see that line, isn't it! 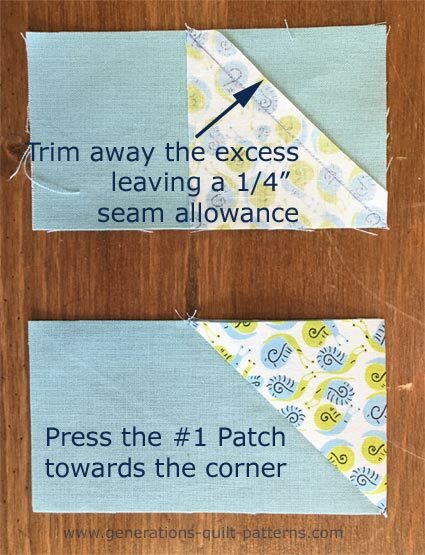 Trim away the excess #1 fabric, leaving behind a quarter inch seam allowance. Eyeballing this cut and using a scissor is good enough. 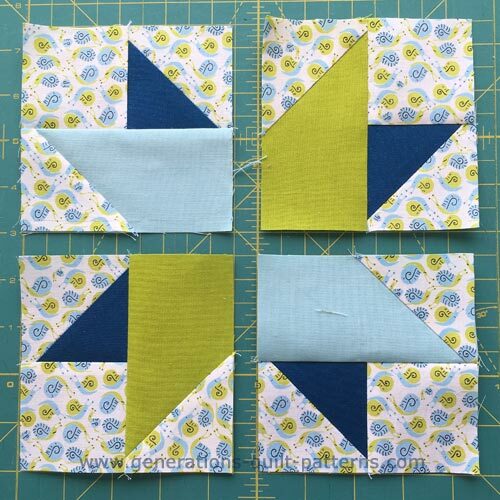 Press the units flat to set the seam and then with the #1 opened and towards the corner. Repeat for all 4 units. 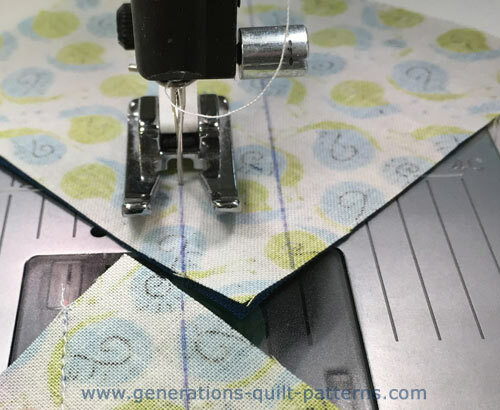 We're using the Quick Pieced method for our HST units. I've used the Quick Quarter Ruler to mark the stitching lines. Sewing with an open toe applique foot makes the lines easier to see. Again, I've used pen so that you can see the lines. For your project, use something a bit less permanent. My marker of choice is the Bohin Mechanical Chalk pencil. 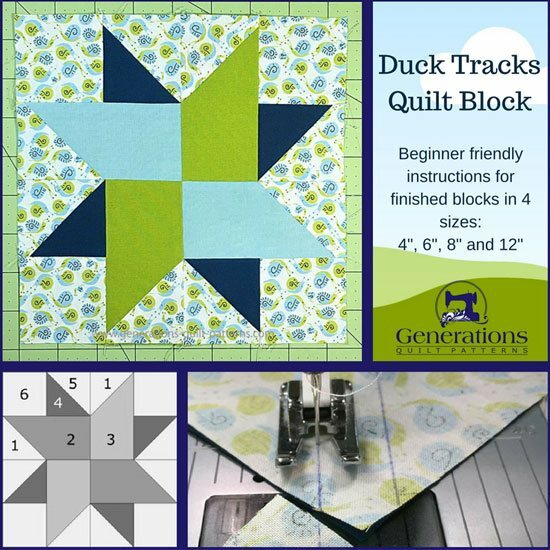 Find the finished size of your Duck Tracks quilt block in the chart below and the corresponding HST size. Trim if needed. From this point forward use your favorite quarter inch foot. Press SA in the direction of the arrows. Make any adjustments you need before assembling the block. Arrange the units as shown below. 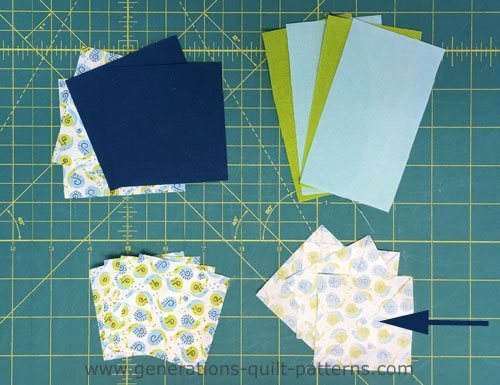 Each is turned a quarter turn just as you would a Pinwheel design. The units are rotated a 1/4 turn as you move around the block. Stitch the units into rows. 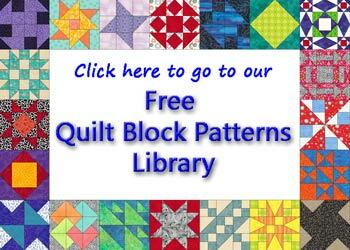 I urge my students to make a sample block when starting a new quilt pattern. This particular block illustrates one of the reasons why. I anticipated pressing the seams that join the blocks into rows AWAY from the connector corner units (away from the bright green and towards the light blue) to minimize bulk. Press the SA TOWARD the green(#3) and in the direction of the arrows. 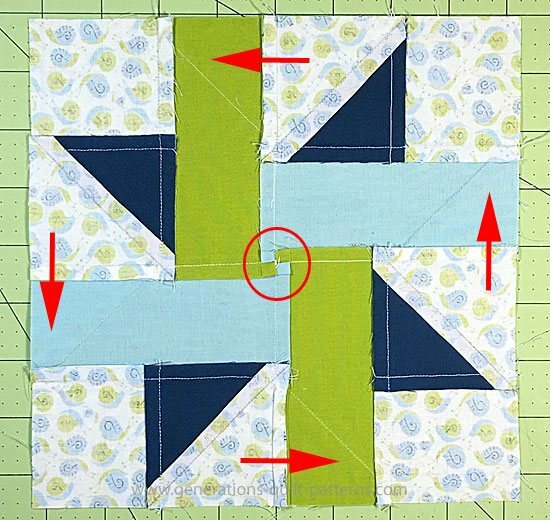 To minimize bulk in the center of the block, I've 'twirled' the SA (red circle). To do this give a tug on the seam allowance to pull out the stitches. Don't trim the threads—just undo the stitches. The seams that join the units together are pressed counterclockwise around the center (red arrows). This is what our Duck Tracks quilt block looks like from the back.